One of the Dr. Seuss-looking plants is called devil's walking stick. The names of a plant, both common and scientific, describe something about the visual appearance or medicinal actions of the plant. Redroot and bloodroot are red. Yellowroot is yellow. Lamb’s ear and hound’s tongue resemble the anatomy of the animal, if one uses the imagination. And puke weed will, indeed, make one vomit. One has to wonder what the story is behind a plant named devil’s walking stick. 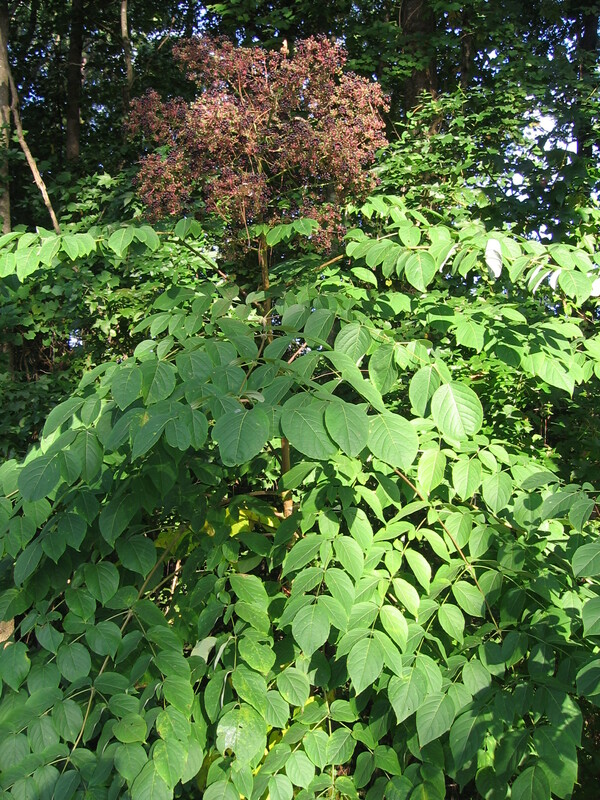 The scientific species name gives a clue (Aralia spinosa), if one speaks Latin. From a distance, though, the plant belongs to the category of silly-looking Dr. Seuss plants. A single, slender stem, which can reach 20 feet tall, is topped with huge, divided leaves collectively in a diamond-like shape. At the very top, in early summer, a giant puff of yellowish-cream-colored blooms attracts hundreds of wasps and butterflies. By fall, the flowers become berries that turn from green to purple-black, weighing over the skinny, shrub stem. The stems to which the berries are attached also turn from green to magenta. In the winter, the whole plant dies back to store energy in the root and send up colony sucker shoots the next spring. The botanical family to which devil’s walking stick belongs is Araliaceae, or the ginseng family, but devil’s walking stick hasn’t been found to have quite the vitality-enhancing qualities of ginseng. Instead, devil’s walking stick, native to the Southeastern U.S., keeps a low profile as a remedy for toothaches – another name is toothache tree – and rheumatism. Cherokee Indians and old-timey Southern herbalists have used the inner bark and berries as anti-inflammatory pain relievers for aching, arthritic joints and sore, decaying teeth with inflamed gums. Eating a couple of the purple-black berries raw is OK. In order to eat more, Tommie Bass, a Southern Appalachian herbalist, recommends cooking them first, and then making them into jelly. Their taste is a little tingly and bitter. The color of the berries indicates they are a rich source of antioxidant flavonoids. Infuse them in brandy to use as an aid for rheumatism. Cherokees also used roots in a salve as a dermatological aid for sores and swellings, such as boils. Since the strangely ornamental native plant is an attractor of birds and pollinating insects, one might consider adding it to a butterfly garden where it will receive afternoon shade. To propagate devil’s walking stick, gather the berries and plant in the fall or spring. Another option is to dig up a sucker and transplant it in the spring. The plant will form a colony, so give it a space where that won’t be a problem.